Inclusions: the services of your licensed private tour guide and taxes. This private walking tour in Paris features a tour of Latin Quarter, the seat of medieval Paris. Your private walking tour in Paris will begin at the Panthéon, home to the tombs of the “Great Men of France.” Your private tour of Paris will stop at the church of Saint Etienne du Mont, a Renaissance church featuring spectacular stained-glass windows, twin spiral staircases, gargoyles, 17th century organ and more. This chapel was dedicated to St. Geneviève, the patron saint of Paris, who was so popular in the Middle Ages that the abbey had to be enlarged to accommodate the pilgrims. Your walking tour in Paris’ Latin Quarter will continue to the Cluny Museum, otherwise known as the National Museum of the Middle Ages. This small museum is located on the ruins of third-century Roman baths and the Hôtel des Abbés de Cluny, a 15th century mansion. 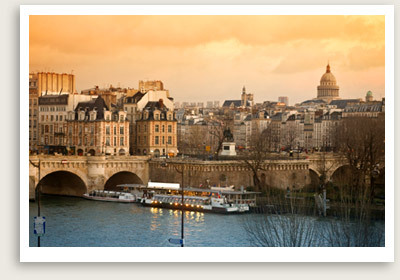 You will also pass by the Sorbonne, home to the historic University of Paris. Finally you will stroll some of the narrow and picturesque streets of the Latin Quarter. Time permitting you will pass through a cobbled passageway from the 1800s to stop by the oldest café in Paris: Café Procope, whose patrons have included Benjamin Franklin, Oscar Wilde, Voltaire and Bonaparte.